The first stop of our SurayeSwipe North American tour is Detroit! Exclusively at the pre-release party, the app will be unlocked to allow guests to experience the full version of the app prior to the official launch. 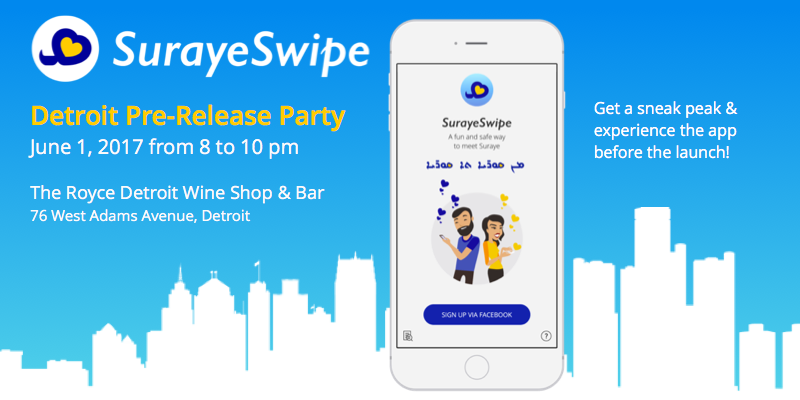 You’ll get a sneak peak of the app, get to swipe away, and get to connect with Suraye in real life! Wine will be served and fun will be had. Come join us Thursday, June 1 from 8pm to 10pm at The Royce! RSVP on our facebook event page here.